You are here: Home / Running / No $$, No Problem – Be Safe for FREE!! No $$, No Problem – Be Safe for FREE!! It is safe to say I have always been a little paranoid – especially when it comes to my health and being safe. I used to be unable to learn about unheard of diseases because that meant I would surely contract them. I’ve gotten over that – a little bit. Even to this day, though, I do take my health and safety seriously. Since I started getting healthy, working out and running, I have become more in-tune to my body than I ever was before. However, I always think about how my awareness would not help me if I was running alone and something bad happened. Whether I am in an accident or passed out, how would someone know how to help me once they found me? How would they know who to call if I couldn’t speak? 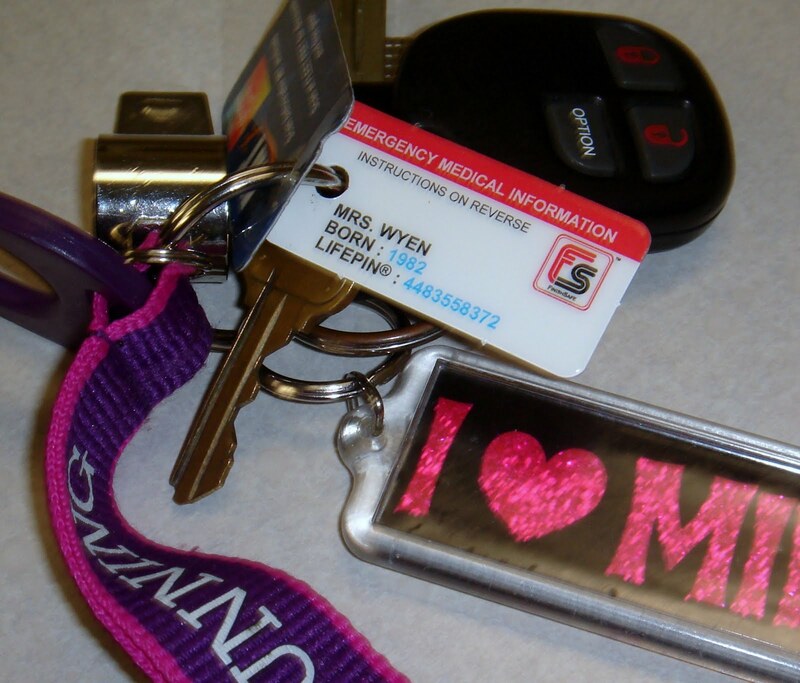 I have looked at Road ID’s time and time again, but have not purchased one because (a) I don’t have a lot of spare cash and also because (b) I do not want to wear another thing on my person. I already wear my Garmin and sometimes that alone irritates me when I have been running for a while. Still, since my mother’s passing, I can’t help but wonder what would happen to me if I were found down and unconscious during a run. My mother, fortunately, was very near to her car (with her car keys) and the first responders we able to find her cell phone which had In Case of Emergency (ICE) contacts in it. That is how the police were able to get in touch with me before she was even taken to the hospital. I am confident that everything was done that day to save her life, yet I can’t help but wonder what would have happened if she had been 3 or more miles away from her car. I may not feel the same way about her receiving help “in time.” And then there’s me – there is no way to identify me. They were all connected to one card and had instructions for how to secure them as well. Money – Because you’re all my friends, they’re free for you through June 30! After you order your FinishTags, check out using the code FAMILY17 and FinishTag will waive all of the charges. That’s an $11.99 value. Who doesn’t like to be safe and save a little cash while doing it? 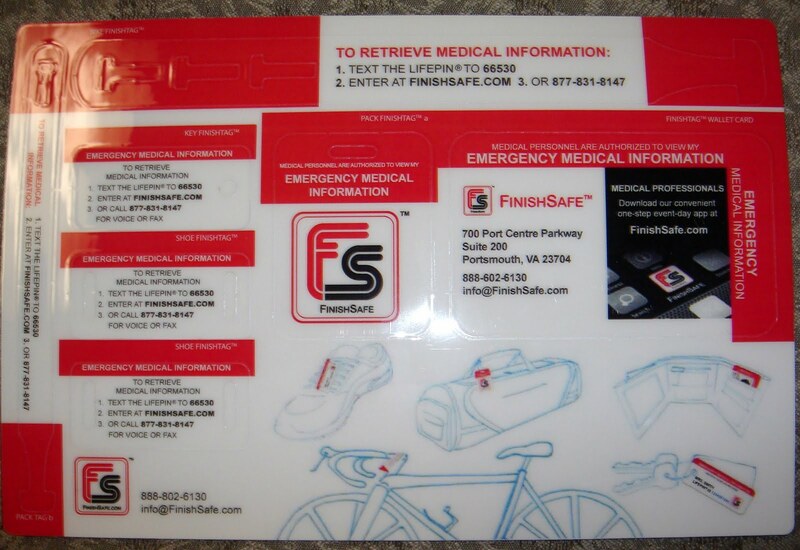 Worry – Hopefully, FinishTags can give you peace of mind if you ever have an accident or emergency, especially if you are running alone or even with others who do not know your personal medical information. 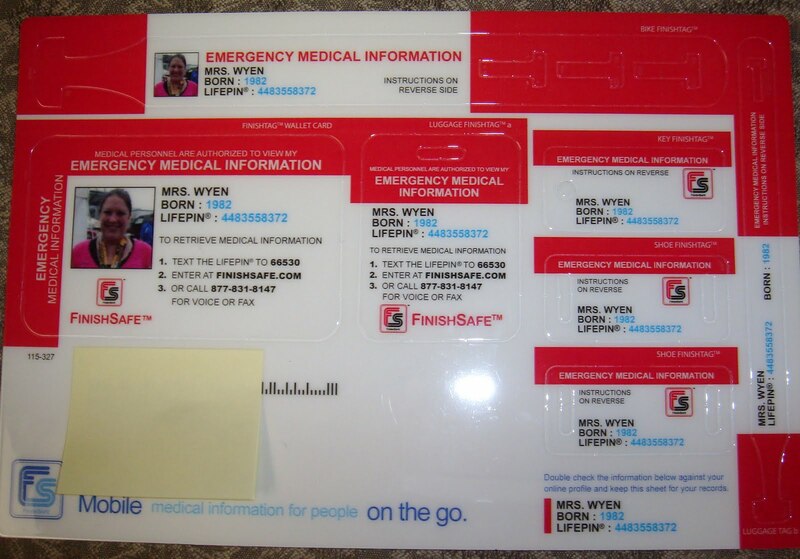 The tags also provide complete instructions for accessing your medical information anytime, day or night. Time – In an emergency, we all know time is crucial. 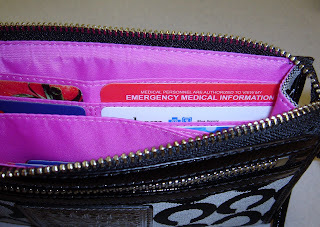 The FinishTag automatically links your medical information to the medics who need it through a unique LifePin number. You’ll be prompted to enter such information as your current medications, any allergies you have, the medical conditions you’re being treated for, and other helpful information that will allow medics to diagnose and treat you quickly and accurately. If you are ever involved in an accident or medical emergency, responders will be able to instantly access your critical information four different ways depending on what is most convenient for the medic: by telephone, smartphone app, online, or using an automatic text-back system. It fits perfectly in my wallet – not that my wallet is super-small or anything. 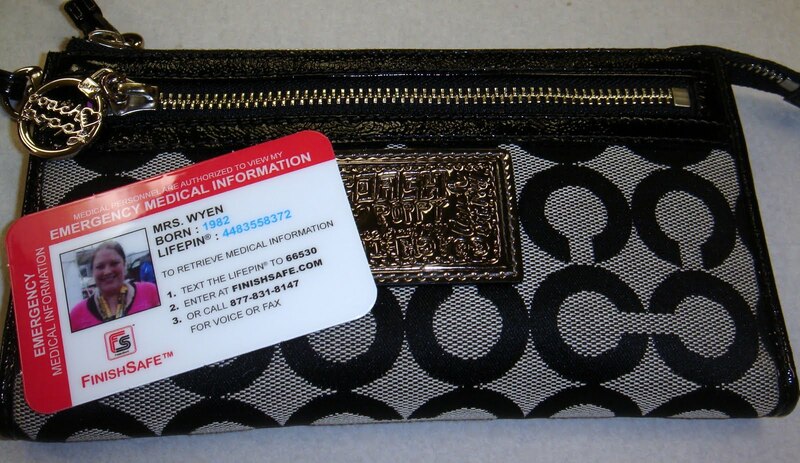 It has complete instructions for accessing my LifePin info, a picture ID to aid in identification and contact info for FinishSafe so maybe if I lose my wallet, someone can return it to me! If medics ever need to look in your wallet, they’ll be sure to see this bold red and white card. It includes a (optional) photo of you to aid in identification. Mine had a picture of me from the Finish Line in Pittsburgh. I already turn my keys in every Saturday for my MIT workout. If my keys are left at the end of the workout, my MIT card will identify them as mine and the other coaches can find me and see that I am okay. If I am not, I now have the FinishTag with my medical information too! I take my keys a lot of places that I don’t take my wallet so the Key Tag will be with me frequently. Also, it does not have a picture ID and says Mrs. and my last name for privacy purposes. 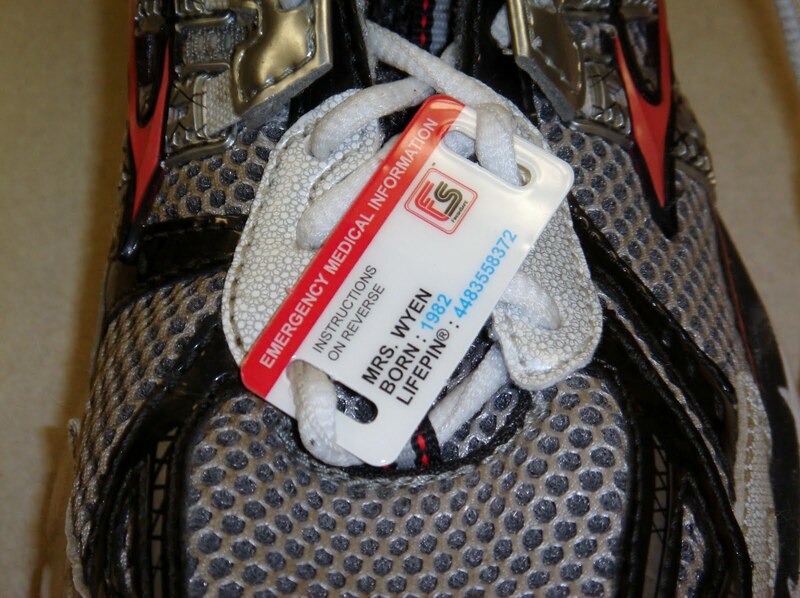 The tag is extremely light weight and laces easily into any pair of shoes. I like it because it will be with me no matter what running outfit I am wearing – I always wear my shoes. Plus, I do not have to wear another thing on my person because it attaches to my shoes. There are two shoe tags if you rotate your shoes. This is great – thanks for the suggestion! I did what Wendy said for myself and my husband! Safety first! AMAZING. absolutely amazing!!!!!!!!! thank you so much for sharing! jumping on this as fast as possible! that’s really great! i’m going to send this around to everyone i know. I’d like to add, please register your info at http://www.myemergencycontactinfo.org/ A friend of mine worked very hard to get this passed with the State of Ohio after she lost her son and wasn’t notified in time. I got mine in the mail this week too! Free stuff is awesome. Free stuff that helps keep you safe and healthy – super awesome. Thank you, thank you! 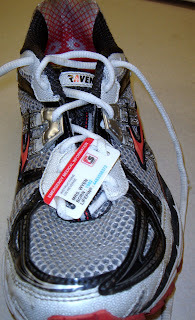 Money has been tight so I haven’t broken down and got a road ID yet – I *usually* remember to grab my drivers license just in case but that doesn’t have emergency contact info or anything on it– I love the “attach to shoelace” idea. Gonna go order mine now!